The Child's Play Remake has found a couple of promising stars to add to its cast. 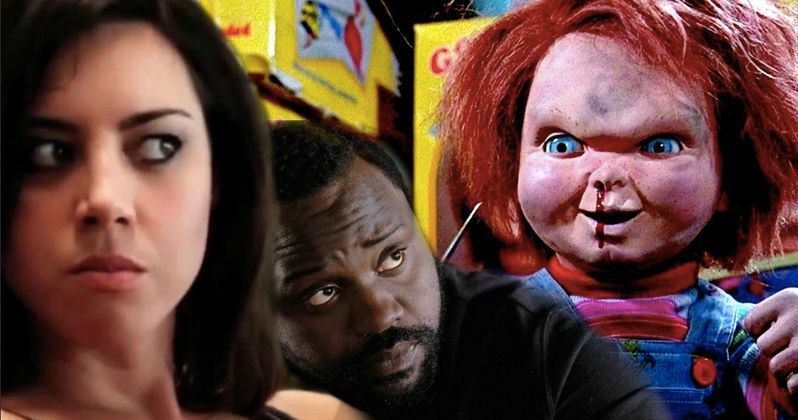 Aubrey Plaza and Brian Tyree Henry are both in talks to star in the remake of the horror classic, which is being produced by MGM. Plaza, should her deal close, will play the mother of the child who winds up with the killer doll this time around, while Henry will portray a detective, but further details regarding his part haven't yet been disclosed. According to a new report, both stars appear to be pretty much locked down, even though they haven't signed on the dotted line just yet. We previously reported that Liv Tyler had been in negotiations to portray the mom in the Child's Play remake. But apparently, those talks broke down and they decided to go a slightly different way with it by casting former Parks and Recreation star Aubrey Plaza instead. Aubrey Plaza has a bit more star power these days and seems like she would be at home in a horror movie such as this, given her turns in movies such as Ingrid Goes West and the FX series Legion. Her casting could help bring some positive attention to this project, which it sorely needs right now. The addition of Brian Tyree Henry also doesn't hurt anything either. He's having an incredible year, as one of the core cast members in FX's Atlanta, to go along with roles in movies like Hotel Artemis and White Boy Rock. Henry will also be featured in director Barry Jenkins' Moonlight follow-up If Beale Street Could Talk and Steve McQueen's Widows, both of which look to be awards season favorites this year. Henry has Emmy and Tony nominations to his name as well. Thus far, this remake hasn't had a lot going for it. Not only will it be abandoning all of the continuity established in the previous seven movies, but Brad Dourif won't be returning to voice Chucky. Nor will the killer doll be portrayed as a Good Guy doll possessed by a serial killer. Instead, it will be a technologically advanced doll of some kind. This particular take will see the doll hunting a group of kids, similar to Stranger Things, as opposed to just one kid. Franchise creator Don Mancini declined to be involved and will continue to develop further home video movie sequels as well as a TV series that will keep the already established canon intact. So yes, there will be two Child's Play franchises going at the same time. Lars Klevberg, who directed the unreleased horror movie Polaroid, is at the helm, working from a script by Tyler Burton Smith (Kung Fury 2).David Katzenberg and Seth Grahame-Smith, who produced last year's hit Stephen King adaptation IT, are on board to produce the project. Production is expected to begin shortly in Vancouver, Canada. We'll be sure to keep you posted as more details on the project are made available. The Child's Play remake does not currently have a release date. This news was first reported by Collider.